Using Amazon CloudFront signed URLs, in WS.WebTV, with the StreamClip extension. Instructions on how to use Amazon CloudFront signed URLs, in WS.WebTV, using the StreamClip extension. • WS.WebTV 1.5.1 or higher. • Your server must have OpenSSL PHP extension enabled. • Version used for the screen captures: WS.WebTV Professional 1.5.1 (all extensions enabled). Some options/features might be different, respect your WebTV, depending on the installed version and extensions you have purchased. When you have configured a Clip or Channel to be private, the WebTV will restrict the access to it by requiring the user to log in; however, once an user has logged in, if it has enough technical knowledge, it can find a way to get the URLs to the video files and share them with other people. Since the WebTV can't restrict the access to the files, then anyone who has the URLs of the files will be able to access and download them (without logging into the WebTV). 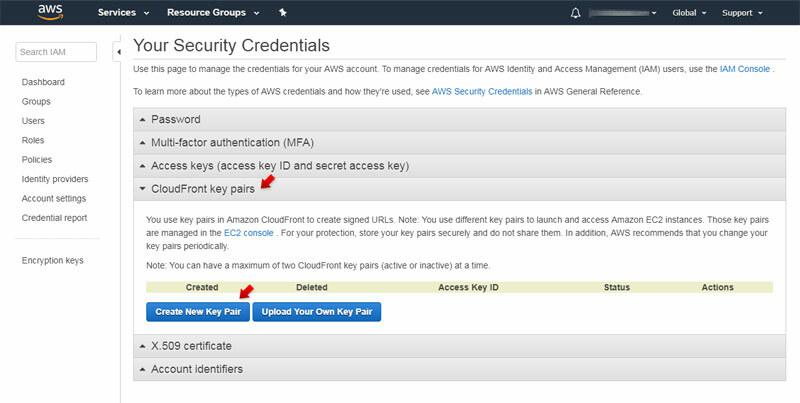 If you are using Amazon S3 and CloudFront to store and serve your video files, then you must know that CloudFront allows you to restrict the access to them by using "signed URLs". When you have configured your CloudFront distribution to restrict the access, then no one will be able to access a file without the correct signed URL (which is an URL with some unique parameters). Signed URLs can specify a time expiration (after which it will not work anymore) as well as the IP of the user allowed to access (an user with a different IP will not be allowed to access) - Important: Read more regarding expiration time and IP restriction at the bottom, in the "Integration Details, Advanced Configuration" paragraph. Since WS.WebTV 1.5.1, you can use CloudFront signed URLs on WS.WebTV to complement the WebTV authentication system and get a better protection for your video files. When using in conjunction, the WebTV will automatically generate the signed URLs (in the background) only for users logged in which are allowed to access the content; additionally, by default, the signed URLs will restrict the access using time expiration as well as the current user IP; therefore, even if the user is able to get the actual URL to a file, no one else will be able to use it. 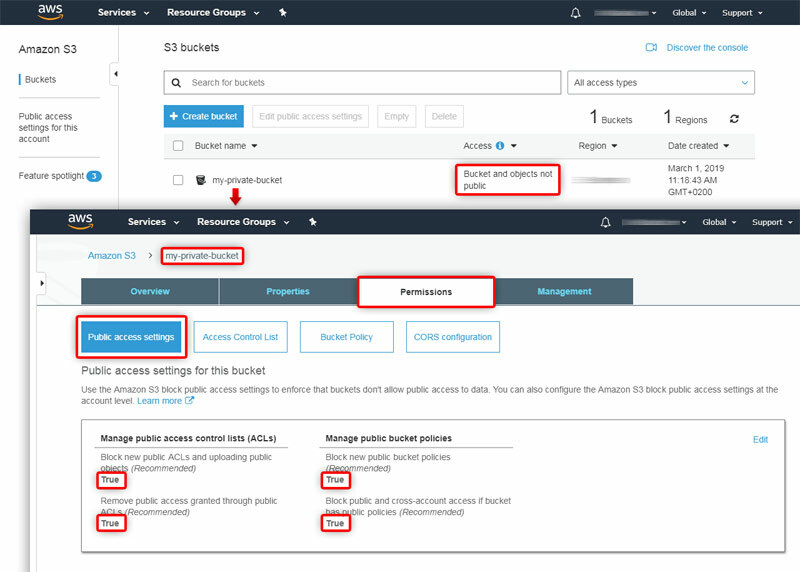 In case you don't already have cretated a bucket in Amazon S3, start by creating one (from the Amazon AWS Console) to store your private content. NOTE: It is recommendable not to share, publicly, the URL of your S3 bucket. When you upload a file to the S3 bucket you must make sure you have not maked it public. 1. Using a "not public" bucket (see the image below). This is the ideal case where you have a bucket exclusively for storing private/restricted objects. Basically you must set the bucket permission so that nothing is public. 2. 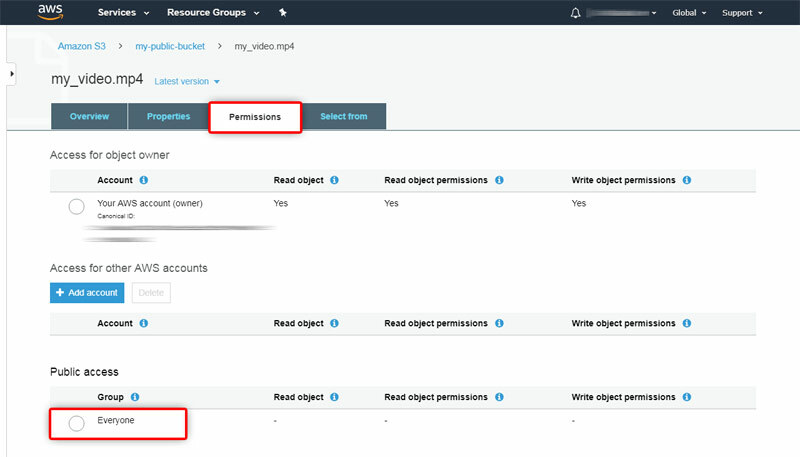 Using a public bucket (where objects can be public and private) but making sure that the uploaded files do not have anything allowed for "Public access" under the Permission settings. Web distribution: Intended for playing back video files, using progressive download/pseudo streaming, on the HTML5 video player. RTMP distribution: Intended for playing back video files, using streaming, on the Flash video player. We recommend creating one "RTMP" Distribution for Flash and another "Web" Distribution for HTML5 and download. In the next screen set the Distribution options. NOTE: We will only focus on the private distribution aspects; for information regarding other options, check the CloudFront documentation. Make sure all options are set correctly and click "Create Distribution". - After creating, return to the CloudFront distribution list and write down the "Domain Name" of the new distribution; you will need it at a later time. - Distributions take several minutes to be enabled. NOTE: We will only focus on the private distribution aspects. For information regarding other options, check the CloudFront documentation. 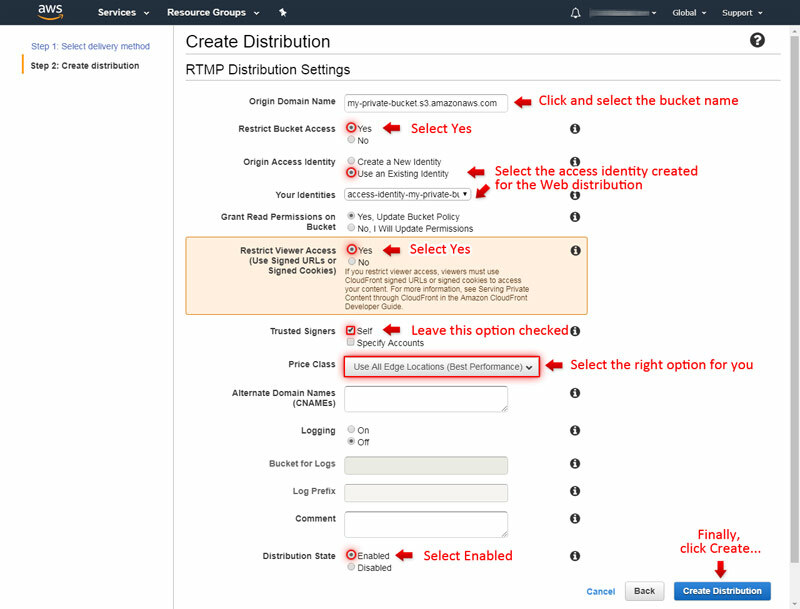 Make sure the options are correctly set and click "Create Distribution". The next step is to get your CloudFront credentials and configure the WebTV to use them (the credentials will be used to "sign" the URLs of the files). IMPORTANT: After clicking the "Create New Key Pair" button, a window will appear notifying you the Key Pair was cerated and offering the option to download the Key files. You must write down your Access Key ID and download the key files. The first thing you need to do now, is to upload your private key file to your WebTV's config/ folder. IMPORTANT NOTE: The private key file downloaded from Amazon includes the Key-Pair-Id in its name; for security reasons, we strognly recommend that you rename the private key file name to include some random numbers or letters. So, if -for example- the downloaded file is pk-AJKAI5XNI8UFLW5E38W7.pem, rename it to pk-AJKAI5XNI8UFLW5E38W7-some-random-numbers.pem. Now that you have created your CloudFront Distributions, got your credentials info and configured the WebTV to use them, you are ready to reference your files in the WebTV!. Please, note the "[cfsig]" at the beginning of the URL and "mp4:" before the file name. Please, note the "[cfsig]" at the beginning of the URL. Please, note the "[cfsig]" at the beginning of the formula and "mp4:" before the special label. Please, note the "[cfsig]" at the beginning of the formula. As you could see; in order for the WebTV to use signed URLs it requires the CloudFront URLs to have the "[cfsig]" prefix. When WS.WebTV finds that special tag, it signs the CloudFront URLs (in the background) using the credentials provided in the configuration file. IMPORTANT NOTE: If you are using IPv6 support in the CloudFront restricted distribution then, so that the Users with IPv6 can watch the content you will need to disable the IP restriction. If you don't think that IPv6 support is important then disable it for the CloudFront distribution. When you enable the "Download" menu for a Clip, and it has been set as "Yes, WebTV Files" or "Yes, WebTV Files + Other Files", and the HTML5 quality fields reference .mp4 files (from a "Web" CloudFront distribution) the system will automatically generate the corresponding (signed) download URLs for those files. Although the previous, in case that, in the "Download" menu of a Clip, you want to provide links to files which are different that the ones referenced in the HTML5 qualities fields, and those files also require signed URLs then follow steps 1 and 2 of the following section. If you plan to enable the "Download" menu for a Clip and you want to provide a (private) CloudFront URL to a file -so it can only be downloaded by authorized users-, then you need to use a special URL generated by the WebTV, which will sign the URL so that authorized users can download the file.